E. Luigi Persico (1791-1860) was an Italian-born sculptor who came to the United States in 1818. He worked in Lancaster, Harrisburg, and Philadelphia before gaining fame for his bust of the Marquis de Lafayette, who was making a farewell tour of America in 1824 and 1825. 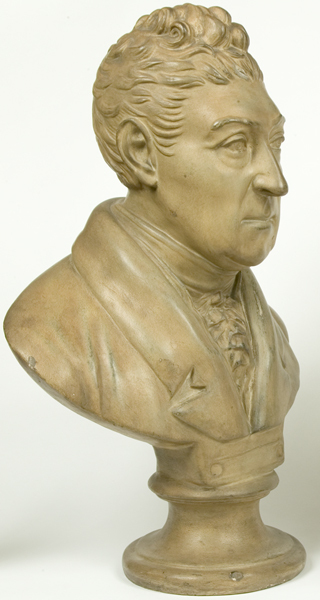 Due to the success of this bust, Persico was commissioned to sculpt several pieces for the United States Capitol building. His allegorical Genius of America, comprising of the figures of America, Justice, and Hope, decorates the east central entrance of the Capitol. His sculptures are neoclassical in style. Marquis de Lafayette, Marie Joseph Paul Yves Roch Gilbert Du Motier (1757-1834), c. 1825. 26" x 17" x 12". Library Company of Philadelphia. Gift of Samuel S. West, 1825. The French nobleman Lafayette volunteered in the Continental army during the American Revolutionary War against the wishes of his King, escaping French imprisonment and British pursuit across the Atlantic to serve in the war. He was a lifelong friend of George Washington and remains a lasting representation of French-American cooperation in the Revolutionary War. In 1824-1825, he made a triumphal tour of each state in America, receiving rousing welcomes by the people. One chronicler of the visit, Gilbert Hunt, wrote that “the roads and ferry boats were thronged with people who were hastening to…testify their gratitude for the services, and respect the character of the illustrious ‘National Guest.’”  Persico’s portrait bust of Lafayette made the sculptor well-known in America and would serve as a catalyst for his lengthy career in the United States. Gilbert J. Hunt, The Tour of General La Fayette Through the U. States, With a Sketch of His Life (New York: Gilbert Hunt, 1825), 46-47.